Whilst I shall endeavour to convey to members, especially all those ex No. 2 Cornmando Brigade, something of the atmosphere and success of this pilgrimage, I confess I have the feeling that my comments will prove quite inadequate, but here goes ! Gatwick Airport on Friday morning, July 20th 1973, saw the commencement of this sentimental journey, when a party totalling 40 members of 2 Cdo Bde and their wives, plus Mr. Ken Shaw of the Queen's Royal Reg ., and Mr. George Mason of the 111 Fd. Regt. R.A., and led by their former Brigade Commander, Major General T. B. L. Churchill, C.B, C.B.E., M.C., flew off by Aviogenex 134A jet to Split where, on arrival, the party was given a most cordial welcome in the V.I.P. lounge by officials of SUBNOR (Yugoslav Veterans Organisation) and Tourist representatives. This was to prove a fitting prelude to the ever increasing expressions of kindness and friendship which every member of the party experienced during this truly memorable pilgrimage-come-holiday. After being introduced to our courier, Mr. Bogdan Cvahte (soon to be affectionately referred to as 'Robbie'), the party immediately sampled the excellence of the arrangements made on our behalf when we boarded for the sea voyage to Vis, not a steamer taking four hours, but the Tourist Company's hydrofoil, which quickly and safely transported us to Komisa, with one short stop on the island of Hvar. As only a small number of the party could be accommodated in the only hotel on the island, the majority were soon being introduced to their hosts in private houses, an arrangement which proved most satisfactory. Everyone came together at meal times in the very pleasant surroundings of the Hotel Bisevo where, in addition to a very satisfactory varied menu, there was an English breakfast for all who desired this. Our first morning consisted of a coach tour, in a coach specially transported to the island from Split for our benefit, of the Island of Vis and, after about six attempts to get round one very difficult corner by the quay at Komisa, we were on our way. Passing through Podhumlje, the former location of the field hospital, we were soon climbing the hills towards the area of Tito's caves and had in fact to cornplete the last steep stretch on foot. Retracing our steps, we boarded the coach and our next stop was at the house formerly used by General Churchill as his Brigade Headquarters. On then for a wreath-laying ceremony at a memorial commemorating the Yugoslav Forces, followed by a similar cerermony at a memorial commemorating fallen R.A.F. Pilots, this stands on the hill overlooking the former airstrip, now cornpletely covered by very healthy looking vines. Continuing along the narrow mountainous, though now well surfaced road, we soon came upon the magnificent view of the harbour and town of Vis, and what amounted to our best view of Fort George, as the fort is still in a restricted area, and consequently no visit was possible to this old Troop H.Q. Whilst in the town, the party greatly enjoyed a reception given by the Mayor of Vis at the Town Hall, and a visit to a very fine museum in which many relics of the war are displayed - photographs too proved most interesting and especially those of Marshal Tito inspecting No. 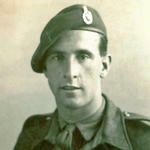 2 Cdo on the airstrip and a group of Partisans and Commandos in which Jimmy Hustwick (one of our party) was immediately identified. The party then returned to Komisa for lunch, and the remainder of that day, and the following day, Sunday, were taken up with swimming and sunbathing by most of the party. Others took this opportunity to have a real good look around Komisa taking pictures, of course, of buildings (little changed in thirty years) used as Officers' and Sergeants' Messes, Troop H.Q. 's, etc. Monday, the 23rd, was taken up by a visit to the nearby island of Bisevo. Unfortunately, the sea was just too rough for entry by boat into the famous 'Blue Grotto', but not to be outdone, the strong swimmers, courageously led by General Churchill, dived overboard for what looked quite a perilous swim into the famous cave---their eventual return to the boats proving a very exciting episode. Moving then to a nearby sandy beach, the party quickly sought cooling refreshment before entering a large barn like building on the beach for a fish picnic, cooked nearby on an open fire. Liquid refreshment was in good supply and, needless to say, this picnic developed into a very jolly occasion, accompanied by rousing partisan songs. Shortly after this the party had the honour of being joined by the British Ambassador and Mrs. Dugald Stewart, together with the Military Attache, Colonel B. A. M. (Tony) Pielow, and they returned with us that evening to Komisa for a very enjoyable reception at the town's most important outside restaurant and dance centre. Making a very early start on Tuesday, the 24th July, approximately half our party set off in our specially chartered motor vessel, 'Argosy', for the island of Brac and, after well over three hours sail, eager eyes scanned the south west coastline trying to discern forrmer landing points. On arrival at Bol we were warmly greeted by local dignatories and former high ranking partisan leaders, and taken by coach over what can only be described as a shocking road (we were told, and so it proved, that Brac roads are by far the worse on any of the islands) to the area south of Nerezisca, where we lunched in the beautifully wooded surroundings of the hotel Vidova Gora. This phase of the pilgrimage proved to be one of the most interesting and enjoyable, and certalnly got off to a fine start when Colonel Jack Churchill came into sight from the other side of the hotel playing his pipes. At the conclusion of the luncheon, all male members of the party received autographed copies of a lovely book about the island and, whilst most of the ladies stayed behind, the males accompanied the General and Colonel on a recce of the hill where the battle-raged thirty years ago. The terrain has, naturally, changed a little with the passing of time, but there was no doubt at all that we were treading the same path as the whole area is still littered with rusty spent cartridge cases, shrapnel and pieces of mortar bombs, etc., many of which were brought home as souvenirs. Eventually, Colonel Jack discovered the area in which he was taken captive, and later the place where Colonel Manners (40 Cdo) and Capt. Wakefield (2 Bde) were temporarily buried, and members stood with heads bowed whilst Colonel Jack played 'Flowers of the Forest' in memory of all those who died on the hill of Brac, an extremely moving moment for us all. It was almost as moving later in the day, when Colonel Jack played his pipes as we left the shores of Brac to return over a rather unpleasant sea to Komisa. Wednesday, July 25th, saw us on the island of Hvar where, during the coach journey for a very enjoyable lunch at Jelsa, we stopped for a moment on the hillside road, overlooking the little village of Grablje, which brought memories racing back to many of the 2 Cdo comrades in the party. The following day we enjoyed seeing the beautiful island of Korcula, and survived our longest coach ride along the length of the island from Vela Luka to the town of Korcula for lunch, stopping for a while at the town of Blato, particularly remembered by Capt. Joe Nicholl, MC. On both Hvar and Korcula we received further very warm welcomes from local and partisan officials and enjoyed delightful lunches in their company. Our last sea trip on Friday, July 28th, was to the island of Solta and our boat first pulled into the little port of Rognac so that comrades could climb the steep hilll to the village of Grohote (a few letting the side down by thumbing a lift in a car ! ). Again the memories came flowing back and various points and buildings were recognised, though the church has been completely renovated since the war. Doubts were raised at first that this was in fact the place No. 2 Cdo attacked, but we were able to settle this satisfactorily when informed that the village square which all were seeking was now no more and in fact a public house and large hall now occupy this site. It was here that a number of the party were invited into a house for refreshment and a very happy occasion this proved to be when the lady of the house realised she had Colonel Jack Churchill under her roof, she was obviously, judging by her spirited farewells to us all, loathe to let him go ! After this we re-embarked and sailed round to Maslinica for lunch at the Hotel Avlija, and then back to Komisa. Saturday, the 28th and Sunday, the 29th, were both days at leisure, though during this period permission was granted for a deputation to enter ths restricted zone close to the mouth of Vis harbour, and a wreath was laid in the cemetery there by General Churchill and Sgt. Bill Humble, M.M., in the presence of Yugoslav Naval and Army Officers. On the last evening we gave a small farewell party to our many friends and hosts. Early on Monday, July 30th. saw our departure from Kornisa and we found it far from easy to say farewell to Vinco Svilioic and Dinko Repanic, our two excellent waiters at the Hotel Bisevo, to Vesna Bozanic and her sister Dina, who had helped so much with our language problems, and especially to our dear friend and Manager of the Hotel, Mr. Dinko Pusic. Many other newly made friends joined them for a touching farewell on the quayside as the hydrofoil moved off, once more to the strains of the pipes. The party then flew frorn Split to Belgrade for three happy days at the Hotel Slavija. where the food and accomodation was excellent, and during this period we enjoyed a reception at the Residence of the British Ambassador, and another at our Hotel, kindly given by SUBNOR (the Yugoslav Veterans Organisation) and where we were received by M. Dusan Sekic, the Secretary General of the Federal Committee of SUBNOR and other high ranking officials. During these two events we were particularly delighted to meet Mrs. Nada Sponza Mimica, whom many remembered as a nurse at the British hospitals on Vis. On Tuesday morning, July 3lst, we gathered at the British War Graves Cemetery, for a short service, so fittingly conducted by the Revd. J. E.C. 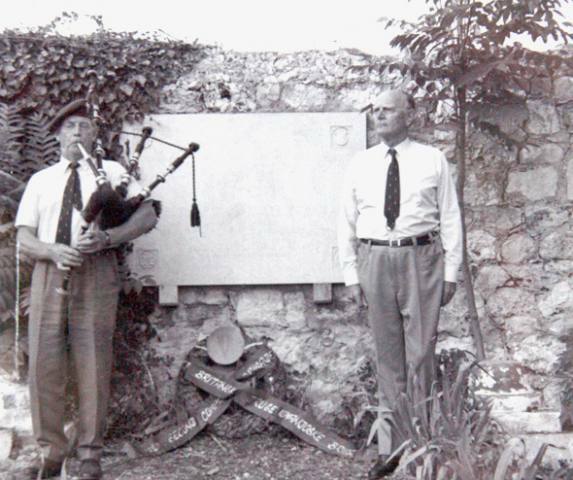 Nicholl, M.C., and where a wreath bearing a Commando Crest was laid jointly by the British Ambassador and General Churchill. Everyone then had in opportunity to visit the graves, which are so beautifully tended, and to sign the register, before moving off for a similar ceremony at the Yugoslav War Cemetery. The following morning the party visited the location of a former German Concentration Camp, where many citizens of Belgrade were put to death, and a wreath was laid here by Mrs. Doreen McWilliams. After this we moved to the National Memorial at Avala, a very imposing monument on the top of a hill, some way out of Belgrade. Thursday evening, the 2nd August, saw our departure from Belgrade and where we were seen off at the airport by former high ranking army officers and by Mr. Branko Golovic and his charming wlfe. who presented each of our party with a red rose. Mr. Golovic, who met us at Split on our arrival, and who remained with us during our time on Vis, rightly deserves a very special 'thank you' for the manner in which he so kindly made himself available whenever guidance was required, and we are indebted to SUBNOR for so kindly arranging for him to be present amongst us. Back for a night to Split, where we bade farewell to our wonderful courier Robbie, whom we all hope to welcome one day to these shores with his charming wife Sheena, and then back to Gatwick and Interviews to the Yugoslav services of the B.B.C. We had in fact received many notices in the Press in Belgrade, one day a full page of news and pictures of the party appeared, so we had not gone unnoticed. On behalf of our party I record our gratitude to General Tom Churchill for mounting this memorable pilgrimage and seeing it through, and also to his brother, Colonel Jack, for his presence and contributions on the pipes - in actual fact we had a spot or two of rain practically after each time he played, and the locals wanted to keep him there, as no rain had fallen for months, but we managed to bring him safely home !